Anybody who makes a shark movie these days may as well name it Just Another Shark Movie that’s Not Jaws because the comparisons are inevitable. The producers of Sharknado knew this going in, and rather than trying to outdo Jaws (totally impossible since it’s indelibly etched into our cultural subconscious), they included some nice nods to fans of Mr. Spielberg’s classic. That’s why today we’re going to talk about HOMAGE. The saying goes that imitation is the sincerest form of flattery. That may be true, but in the arts, there’s a fine line between imitation and downright plagiarism. The concept of an HOMAGE is more subtle, more respectful. Its intentions are to honor the work it’s paying tribute to without damaging it in any way, and Sharknado does that plainly in three separate scenes. The first is a scene near the beginning where a shark is killed by having a propane tank shoved in its mouth and then shot, destroying it. 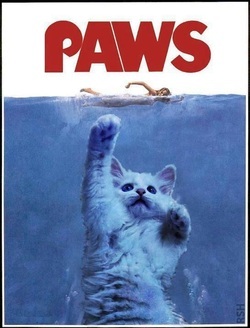 Well, that’s pretty much the ending of Jaws. The only thing missing is the “Smile you son of a B****!” line spouted by Roy Scheider. The second nod to the classic is in a scene where one of the females is comparing scars with one of the males and is telling how she got a scar. This is very reminiscent of the scene in Jaws where Quint and Hooper are comparing scars and Quint tells the anecdote about where his scar came from. Near the end is the line, “So, eleven hundred men went in the water, three hundred and sixteen men come out, the sharks took the rest, June the 29, 1945.” In Sharknado, the female says, “Six people went into the water, and one little girl came out.” For fans of the classic, this puts a smile on your face! 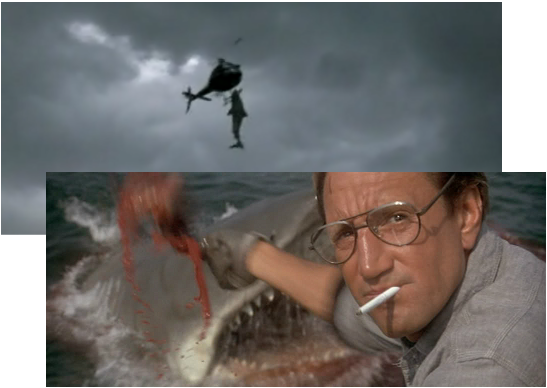 The final reference comes when they are in a helicopter nearing the funnel of the hurricane about to drop a bomb they think will break up the eye or something…and again, a character sees so many sharks in the water and says, “We’re gonna need a bigger chopper.” Obviously a call back to one of the greatest lines in movie history. Didn't want to make this movie, but his wife made him because they had another child on the way! And you know those 90210 royalty checks must be sliming down by now. So while this film never aspires to be more than some mindless fun with fins, it respectfully nods to its big brother in several scenes as homage. I think Spielberg would be proud. Either that or he’s on the phone right now with his copyright attorneys! When does tribute become stealing?